Last week, we learned about Random Forest Algorithm. Now we know it helps us reduce a model’s variance by building models on resampled data and thereby increases its generalization capability. Good! Now, you might be wondering, what to do next for increasing a model’s prediction accuracy ? After all, an ideal model is one which is good at both generalization and prediction accuracy. This brings us to Boosting Algorithms. Developed in 1989, the family of boosting algorithms has been improved over the years. In this article, we’ll learn about XGBoost algorithm. XGBoost is the most popular machine learning algorithm these days. Regardless of the data type (regression or classification), it is well known to provide better solutions than other ML algorithms. In fact, since its inception (early 2014), it has become the “true love” of kaggle users to deal with structured data. So, if you are planning to compete on Kaggle, xgboost is one algorithm you need to master. In this article, you’ll learn about core concepts of the XGBoost algorithm. In addition, we’ll look into its practical side, i.e., improving the xgboost model using parameter tuning in R.
On 5th March 2017: How to win Machine Learning Competitions ? What is XGBoost ? Why is it so good ? Flexibility: In addition to regression, classification, and ranking problems, it supports user-defined objective functions also. An objective function is used to measure the performance of the model given a certain set of parameters. Furthermore, it supports user defined evaluation metrics as well. Save and Reload: XGBoost gives us a feature to save our data matrix and model and reload it later. Suppose, we have a large data set, we can simply save the model and use it in future instead of wasting time redoing the computation. Tree Pruning: Unlike GBM, where tree pruning stops once a negative loss is encountered, XGBoost grows the tree upto max_depth and then prune backward until the improvement in loss function is below a threshold. I’m sure now you are excited to master this algorithm. But remember, with great power comes great difficulties too. You might learn to use this algorithm in a few minutes, but optimizing it is a challenge. Don’t worry, we shall look into it in following sections. How does XGBoost work ? XGBoost belongs to a family of boosting algorithms that convert weak learners into strong learners. A weak learner is one which is slightly better than random guessing. Let’s understand boosting first (in general). Four classifiers (in 4 boxes), shown above, are trying hard to classify + and - classes as homogeneously as possible. Let’s understand this picture well. Box 1: The first classifier creates a vertical line (split) at D1. It says anything to the left of D1 is + and anything to the right of D1 is -. However, this classifier misclassifies three + points. Box 2: The next classifier says don’t worry I will correct your mistakes. Therefore, it gives more weight to the three + misclassified points (see bigger size of +) and creates a vertical line at D2. Again it says, anything to right of D2 is - and left is +. Still, it makes mistakes by incorrectly classifying three - points. Box 3: The next classifier continues to bestow support. Again, it gives more weight to the three - misclassified points and creates a horizontal line at D3. Still, this classifier fails to classify the points (in circle) correctly. Remember that each of these classifiers has a misclassification error associated with them. Boxes 1,2, and 3 are weak classifiers. These classifiers will now be used to create a strong classifier Box 4. 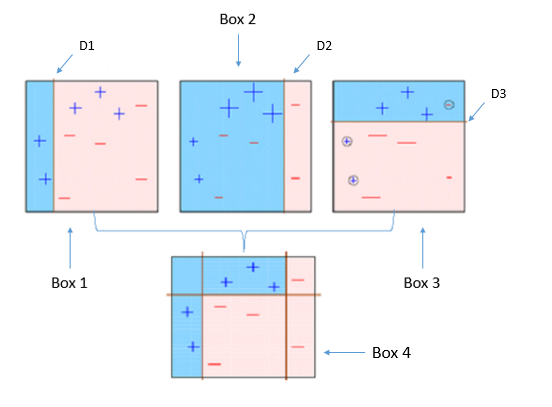 Box 4: It is a weighted combination of the weak classifiers. As you can see, it does good job at classifying all the points correctly. That’s the basic idea behind boosting algorithms. The very next model capitalizes on the misclassification/error of previous model and tries to reduce it. Now, let’s come to XGBoost. Classification Problems: To solve such problems, it uses booster = gbtree parameter; i.e., a tree is grown one after other and attempts to reduce misclassification rate in subsequent iterations. In this, the next tree is built by giving a higher weight to misclassified points by the previous tree (as explained above). Gradient Descent: It is a method which comprises a vector of weights (or coefficients) where we calculate their partial derivative with respective to zero. The motive behind calculating their partial derivative is to find the local minima of the loss function (RSS), which is convex in nature. In simple words, gradient descent tries to optimize the loss function by tuning different values of coefficients to minimize the error. Hopefully, up till now, you have developed a basic intuition around how boosting and xgboost works. Let’s proceed to understand its parameters. After all, using xgboost without parameter tuning is like driving a car without changing its gears; you can never up your speed. Note: In R, xgboost package uses a matrix of input data instead of a data frame. Every parameter has a significant role to play in the model’s performance. 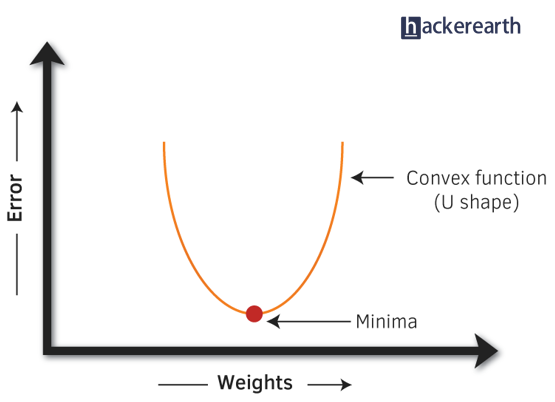 Before hypertuning, let’s first understand about these parameters and their importance. In this article, I’ve only explained the most frequently used and tunable parameters. To look at all the parameters, you can refer to its official documentation. Sets the booster type (gbtree, gblinear or dart) to use. For classification problems, you can use gbtree, dart. For regression, you can use any. Activates parallel computation. Generally, people don’t change it as using maximum cores leads to the fastest computation. If you set it to 1, your R console will get flooded with running messages. Better not to change it. It controls the maximum number of iterations. For classification, it is similar to the number of trees to grow. It controls the learning rate, i.e., the rate at which our model learns patterns in data. After every round, it shrinks the feature weights to reach the best optimum. Lower eta leads to slower computation. It must be supported by increase in nrounds. Higher the value, higher the regularization. Regularization means penalizing large coefficients which don’t improve the model’s performance. default = 0 means no regularization. It controls the depth of the tree. In regression, it refers to the minimum number of instances required in a child node. In classification, if the leaf node has a minimum sum of instance weight (calculated by second order partial derivative) lower than min_child_weight, the tree splitting stops. In simple words, it blocks the potential feature interactions to prevent overfitting. Should be tuned using CV. It controls the number of samples (observations) supplied to a tree. Using linear booster has relatively lesser parameters to tune, hence it computes much faster than gbtree booster. It controls the maximum number of iterations (steps) required for gradient descent to converge. These parameters specify methods for the loss function and model evaluation. In addition to the parameters listed below, you are free to use a customized objective / evaluation function. multi:softmax – multiclassification using softmax objective. It returns predicted class labels. It requires setting num_class parameter denoting number of unique prediction classes. multi:softprob – multiclassification using softmax objective. It returns predicted class probabilities. These metrics are used to evaluate a model’s accuracy on validation data. For regression, default metric is RMSE. For classification, default metric is error. We’ve looked at how xgboost works, the significance of each of its tuning parameter, and how it affects the model’s performance. 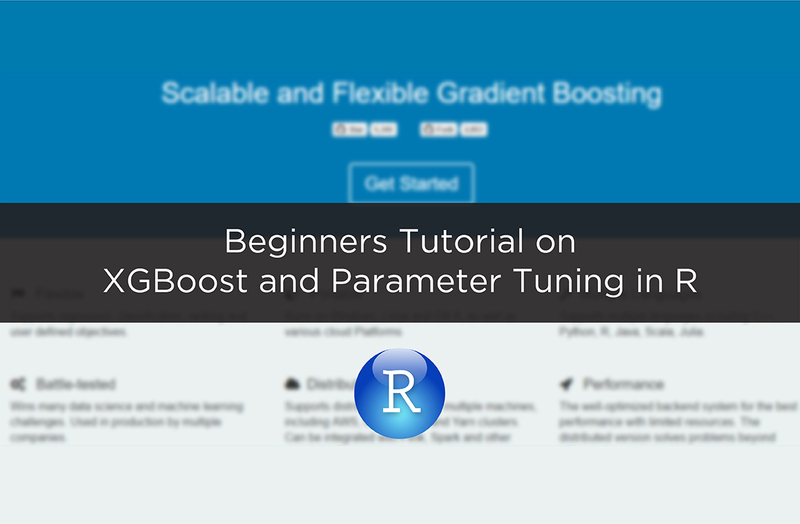 Let’s bolster our newly acquired knowledge by solving a practical problem in R.
In this practical section, we’ll learn to tune xgboost in two ways: using the xgboost package and MLR package. I don’t see the xgboost R package having any inbuilt feature for doing grid/random search. To overcome this bottleneck, we’ll use MLR to perform the extensive parametric search and try to obtain optimal accuracy. I’ll use the adult data set from my previous random forest tutorial. This data set poses a classification problem where our job is to predict if the given user will have a salary <=50K or >50K. First, you build the xgboost model using default parameters. You might be surprised to see that default parameters sometimes give impressive accuracy. If you get a depressing model accuracy, do this: fix eta = 0.1, leave the rest of the parameters at default value, using xgb.cv function get best n_rounds. Now, build a model with these parameters and check the accuracy. Otherwise, you can perform a grid search on rest of the parameters (max_depth, gamma, subsample, colsample_bytree etc) by fixing eta and nrounds. Note: If using gbtree, don’t introduce gamma until you see a significant difference in your train and test error. Using the best parameters from grid search, tune the regularization parameters(alpha,lambda) if required. At last, increase/decrease eta and follow the procedure. But remember, excessively lower eta values would allow the model to learn deep interactions in the data and in this process, it might capture noise. So be careful! > path <- "~/December 2016/XGBoost_Tutorial"
#set all missing value as "Missing"
Using the inbuilt xgb.cv function, let’s calculate the best nround for this model. In addition, this function also returns CV error, which is an estimate of test error. The objective function binary:logistic returns output predictions rather than labels. To convert it, we need to manually use a cutoff value. As seen above, I’ve used 0.5 as my cutoff value for predictions. We can calculate our model’s accuracy using confusionMatrix() function from caret package. Now, we’ll set the learner and fix the number of rounds and eta as discussed above. With stratify=T, we’ll ensure that distribution of target class is maintained in the resampled data sets. If you’ve noticed above, in the parameter set, I didn’t consider gamma for tuning. Simply because during cross validation, we saw that train and test error are in sync with each other. Had either one of them been dragging or rushing, we could have brought this parameter into action. Now, we’ll set the search optimization strategy. Though, xgboost is fast, instead of grid search, we’ll use random search to find the best parameters. In random search, we’ll build 10 models with different parameters, and choose the one with the least error. You are free to build any number of models. We’ll also set a parallel backend to ensure faster computation. Make sure you’ve not opened several applications in backend. We’ll use all the cores in your machine. This newly obtained tuned CV accuracy is better than our default xgboost model. To check the tuning result, write mytune in your R console and press Enter. Let’s build a model using tuned parameters and check the final test accuracy. We’ve made our predictions on the test set. Let’s check our model’s accuracy. As you see, we’ve achieved a better accuracy than our default xgboost model (86.45%). For tuning the xgboost model, always remember that simple tuning leads to better predictions. I’ll leave you here. What’s next? If you are still curious to improve the model’s accuracy, update eta, find the best parameters using random search and build the model. Tell me in comments if you’ve achieved better accuracy. Here is the complete github script for code shared above. This article is meant to help beginners in machine learning quickly learn the xgboost algorithm. If this article makes you want to learn more, I suggest you to read this paper published by its author. I would like to thank kaggler laurae whose valuable discussion helped me a lot in understanding xgboost tuning. As I said in the beginning, learning how to run xgboost is easy. The real challenge lies in understanding what happens behind the code. I hope this article gave you enough information to help you build your next xgboost model better. In this article, I discussed the basics of the boosting algorithm and how xgboost implements it in an efficient manner. 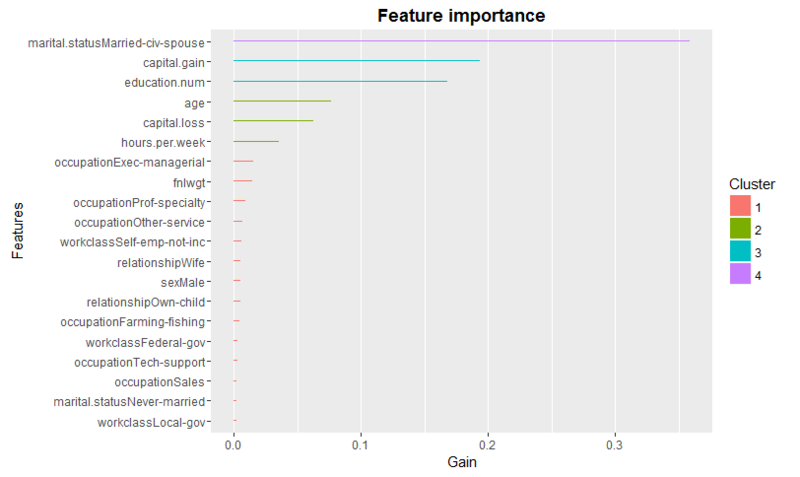 Also, we learned how to build models using xgboost with parameter tuning in R.
Feel free to drop in your comments, experiences, and knowledge gathered while building models using xgboost. Making an effort to help people understand Machine Learning. I believe your educational background doesn't stop you to pursue ML & Data Science. Earned Masters in F/M, a self taught data science professional. Previously worked at Analytics Vidhya. Now solving ML & Growth challenges at HackerEarth!